Apache Hive is one of the most popular tools for analyzing large datasets stored in a Hadoop cluster using SQL. Data analysts and scientists use Hive to query, summarize, explore, and analyze big data. With the introduction of Hive LLAP (Low Latency Analytical Processing), the notion of Hive being just a batch processing tool has changed. LLAP uses long-lived daemons with intelligent in-memory caching to circumvent batch-oriented latency and provide sub-second query response times. This post provides an overview of Hive LLAP, including its architecture and common use cases for boosting query performance. 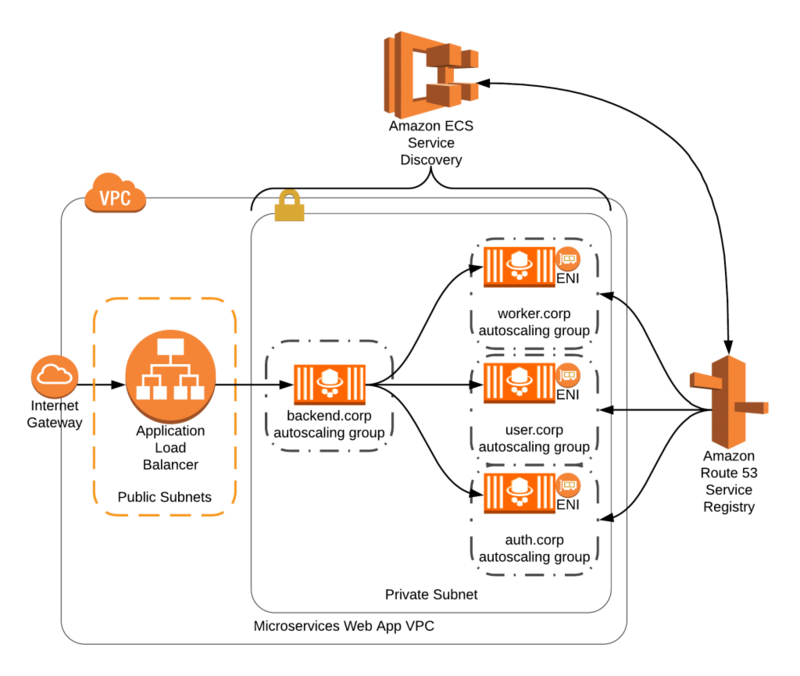 You will learn how to install and configure Hive LLAP on an Amazon EMR cluster and run queries on LLAP daemons. Hive LLAP was introduced in Apache Hive 2.0, which provides very fast processing of queries. It uses persistent daemons that are deployed on a Hadoop YARN cluster using Apache Slider. These daemons are long-running and provide functionality such as I/O with DataNode, in-memory caching, query processing, and fine-grained access control. And since the daemons are always running in the cluster, it saves substantial overhead of launching new YARN containers for every new Hive session, thereby avoiding long startup times. When Hive is configured in hybrid execution mode, small and short queries execute directly on LLAP daemons. Heavy lifting (like large shuffles in the reduce stage) is performed in YARN containers that belong to the application. Resources (CPU, memory, etc.) are obtained in a traditional fashion using YARN. After the resources are obtained, the execution engine can decide which resources are to be allocated to LLAP, or it can launch Apache Tez processors in separate YARN containers. You can also configure Hive to run all the processing workloads on LLAP daemons for querying small datasets at lightning fast speeds. LLAP daemons are launched under YARN management to ensure that the nodes don’t get overloaded with the compute resources of these daemons. You can use scheduling queues to make sure that there is enough compute capacity for other YARN applications to run. How do you install Hive LLAP in Amazon EMR? 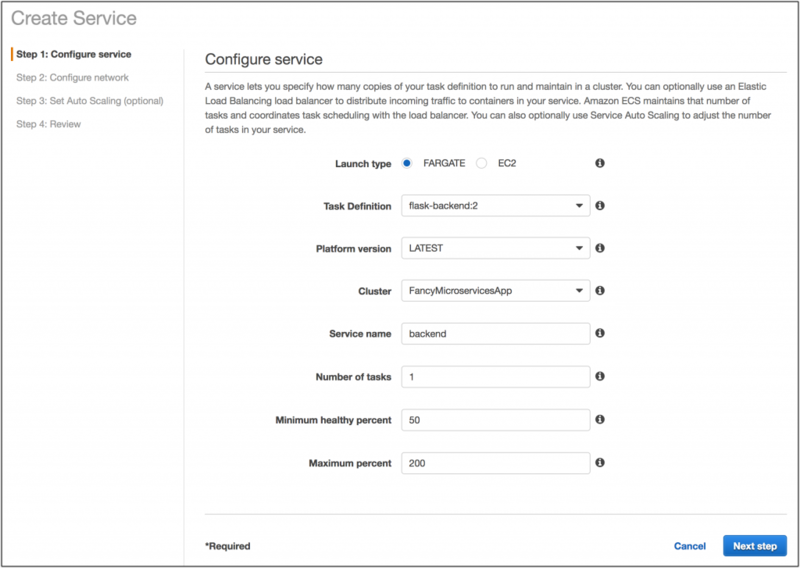 This BA downloads and installs Apache Slider on the cluster and configures LLAP so that it works with EMR Hive. For LLAP to work, the EMR cluster must have Hive, Tez, and Apache Zookeeper installed. You can pass the following arguments to the BA. This section describes how you can try the faster Hive queries with LLAP using the TPC-DS testbench for Hive on Amazon EMR. This query finished in about 80 seconds. The difference in query execution time is almost 1.7 times when using just YARN containers in contrast to running the query on LLAP daemons. And with every rerun of the query, you notice that the execution time substantially decreases by the virtue of in-memory caching by LLAP daemons. In this post, I introduced Hive LLAP as a way to boost Hive query performance. I discussed its architecture and described several use cases for the component. 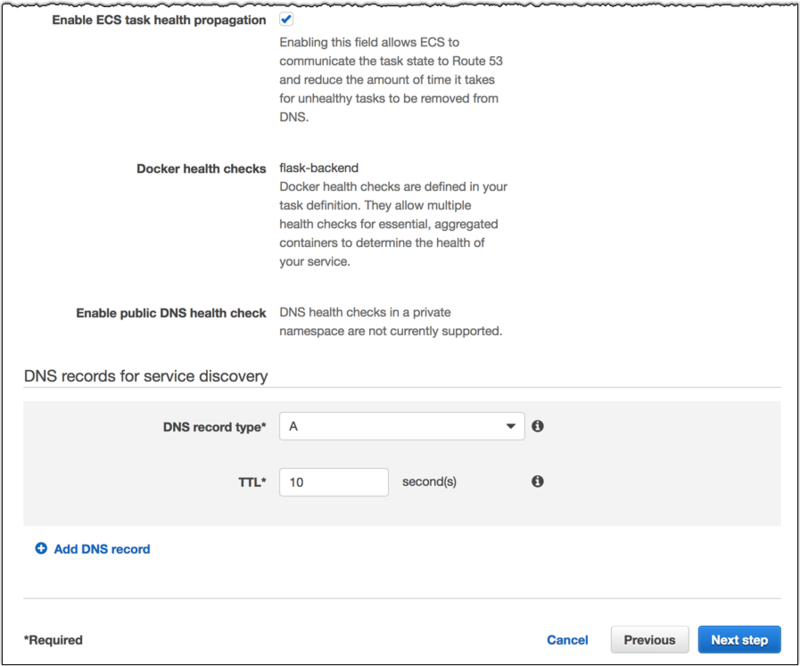 I showed how you can install and configure Hive LLAP on an Amazon EMR cluster and how you can run queries on LLAP daemons. If you have questions about using Hive LLAP on Amazon EMR or would like to share your use cases, please leave a comment below. Learn how to to automatically partition Hive external tables with AWS. Jigar Mistry is a Hadoop Systems Engineer with Amazon Web Services. He works with customers to provide them architectural guidance and technical support for processing large datasets in the cloud using open-source applications. In his spare time, he enjoys going for camping and exploring different restaurants in the Seattle area. Security updates have been issued by Arch Linux (bind), Debian (request-tracker4, rt-authen-externalauth, and zookeeper), openSUSE (mercurial, otrs, thunderbird, and tor), and Ubuntu (libmwaw and zziplib). Have you ever needed to move a large amount of data between Amazon S3 and Hadoop Distributed File System (HDFS) but found that the data set was too large for a simple copy operation? EMR can help you with this. In addition to processing and analyzing petabytes of data, EMR can move large amounts of data. The source location may contain extra files that we don’t necessarily want to copy. Here, we can use filters based on regular expressions to do things such as copying files with the .log extension only. After the preceding operation, the source location has only empty folders, and the target location contains all files. The important things to remember here are that S3DistCp deletes only files with the --deleteOnSuccess flag and that it doesn’t delete parent folders, even when they are empty. In real life, the upstream process drops files in some cadence. For instance, new files might get created every hour, or every minute. The downstream process can be configured to pick it up at a different schedule. Let’s say data lands on S3 and we want to process it on HDFS daily. Copying all files every time doesn’t scale very well. Fortunately, S3DistCp has a built-in solution for that. S3DistCp creates the file in the local file system using the provided path, /tmp/mymanifest.gz. When the copy operation finishes, it moves that manifest to <DESTINATION LOCATION>. Hadoop is optimized for reading a fewer number of large files rather than many small files, whether from S3 or HDFS. You can use S3DistCp to aggregate small files into fewer large files of a size that you choose, which can optimize your analysis for both performance and cost. In the following example, we combine small files into bigger files. We do so by using a regular expression with the –groupBy option. As you can see, seven data files were combined into two with a size close to the requested 10 MB. The *.meta file was filtered out because --groupBy pattern works in a similar way to –srcPattern. We recommend keeping files larger than the default block size, which is 128 MB on EMR. The name of the final file is composed of groups in the regular expression used in --groupBy plus some number to make the name unique. The pattern must have at least one group defined. As you can see, names of final files consist of concatenation of 3 groups from the regular expression (2017-), (\d\d), (log). In this case, the key information is contained in Created 0 files to copy 0 files. S3DistCp didn’t find any files to copy because the regular expression in the --groupBy option doesn’t match any files in the source location. The reason for this issue varies. For example, it can be a mistake in the specified pattern. In the preceding example, we don’t have any files for the year 2018. Another common reason is incorrect escaping of the pattern when we submit S3DistCp command as a step, which is addressed later later in this post. The default upload chunk size when doing an S3 multipart upload is 128 MB. When files are larger than 1 TB, the total number of parts can reach over 10,000. Such a large number of parts can make the job run for a very long time or even fail. In this case, you can improve job performance by increasing the size of each part. In S3DistCp, you can do this by using the --multipartUploadChunkSize option. Let’s test how it works on several files about 200 GB in size. With the default part size, it takes about 84 minutes to copy them to S3 from HDFS. You can run the S3DistCp tool in several ways. First, you can SSH to the master node and execute the command in a terminal window as we did in the preceding examples. This approach might be convenient for many use cases, but sometimes you might want to create a cluster that has some data on HDFS. 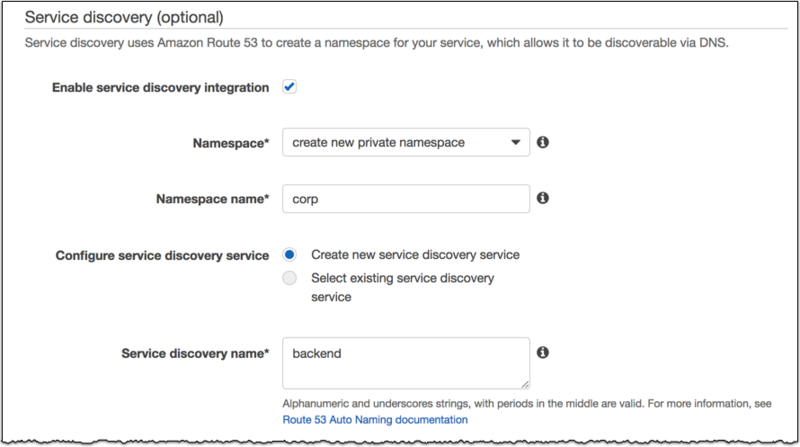 You can do this by submitting a step directly in the AWS Management Console when creating a cluster. Notice that we didn’t add quotation marks around our pattern. We needed quotation marks when we were using bash in the terminal window, but not here. The console takes care of escaping and transferring our arguments to the command on the cluster. This post showed you the basics of how S3DistCp works and highlighted some of its most useful features. It covered how you can use S3DistCp to optimize for raw files of different sizes and also selectively copy different files between locations. We also looked at several options for using the tool from SSH, the AWS Management Console, and the AWS CLI. If you have questions or suggestions, leave a message in the comments. Take your new knowledge to the next level! Click on the post below and learn the top 10 tips to improve query performance in Amazon Athena. Illya Yalovyy is a Senior Software Development Engineer with Amazon Web Services. He works on cutting-edge features of EMR and is heavily involved in open source projects such as Apache Hive, Apache Zookeeper, Apache Sqoop. His spare time is completely dedicated to his children and family. Security updates have been issued by Arch Linux (freeradius and libtasn1), Debian (nss, openldap, picocom, strongswan, wordpress, and zookeeper), Mageia (openvpn), openSUSE (mariadb), Oracle (kernel and sudo), and SUSE (strongswan). A version of this byline was originally written for and appears in CIO Review. A successful private cloud presents a consistent and reliable facade over the complexities of hyperscale infrastructure. It must simultaneously handle constant organic traffic growth, unanticipated spikes, a multitude of hardware vendors, and discordant customer demands. The depth of this complexity only increases with the age of the business, leaving a private cloud operator saddled with legacy hardware, old network infrastructure, customers dependent on legacy operating systems, and the list goes on. These are the foundations of the horror stories told by grizzled operators around the campfire. Providing a plethora of services globally for over a billion active users requires a hyperscale infrastructure. Yahoo’s on-premises infrastructure is comprised of datacenters housing hundreds of thousands of physical and virtual compute resources globally, connected via a multi-terabit network backbone. As one of the very first hyperscale internet companies in the world, Yahoo’s infrastructure had grown organically – things were built, and rebuilt, as the company learned and grew. The resulting web of modern and legacy infrastructure became progressively more difficult to manage. Initial attempts to manage this via IaaS (Infrastructure-as-a-Service) taught some hard lessons. However, those lessons served us well when OpenStack was selected to manage Yahoo’s datacenters, some of which are shared below. Chief amongst the lessons learned prior to OpenStack was that IaaS must be presented as a core service to the whole organization by a dedicated team. An a-la-carte-IaaS, where each user is expected to manage their own control plane and inventory, just isn’t sustainable at scale. Multiple teams tackling the same challenges involved in the curation of software, deployment, upkeep, and security within an organization is not just a duplication of effort; it removes the opportunity for improved synergy with all levels of the business. The first OpenStack cluster, with a centralized dedicated developer and service engineering team, went live in June 2012. This model has served us well and has been a crucial piece of making OpenStack succeed at Yahoo. One of the biggest advantages to a centralized, core team is the ability to collaborate with the foundational teams upon which any business is built: Supply chain, Datacenter Site-Operations, Finance, and finally our customers, the engineering teams. Building a close relationship with these vital parts of the business provides the ability to streamline the process of scaling inventory and presenting on-demand infrastructure to the company. Our developer productivity clusters, named “OpenHouse,” were a huge hit. Ideation and experimentation are core to developers’ DNA at Yahoo. It empowers our engineers to innovate, prototype, develop, and quickly iterate on ideas. No longer is a developer reliant on a static and costly development machine under their desk. OpenHouse enables developer agility and cost savings by obviating the desktop. From a humble beginning of a single, small OpenStack cluster, Yahoo’s OpenStack footprint is growing beyond 100,000 VM instances globally, with our single largest virtual machine cluster running over a thousand compute nodes, without using Nova Cells. Until this point, Yahoo’s production footprint was nearly 100% focused on baremetal – a part of the business that one cannot simply ignore. In 2013, Yahoo OpenStack Baremetal began to manage all new compute deployments. Interestingly, after moving to a common API to provision baremetal and virtual machines, there was a marked increase in demand for virtual machines. Developers across all major business units ranging from Yahoo Mail, Video, News, Finance, Sports and many more, were thrilled with getting instant access to compute resources to hit the ground running on their projects. Today, the OpenStack team is continuing to fully migrate the business to OpenStack-managed. Our baremetal footprint is well beyond that of our VMs, with over 100,000 baremetal instances provisioned by OpenStack Nova via Ironic. How did Yahoo hit this scale? Scaling OpenStack begins with understanding how its various components work and how they communicate with one another. This topic can be very deep and for the sake of brevity, we’ll hit the high points. Do not overlook the unique resource constraints for the services which power your cloud, nor the fashion in which those services are to be used. Leverage that understanding to drive hardware selection. For example, when one examines the role of the database server in an OpenStack cluster, and considers the multitudinous calls to the database: compute node heartbeats, instance state changes, normal user operations, and so on; they would conclude this core component is extremely busy in even a modest-sized Nova cluster, and in need of adequate computational resources to perform. Yet many deployers skimp on the hardware. The performance of the whole cluster is bottlenecked by the DB I/O. By thinking ahead you can save yourself a lot of heartburn later on. Our cluster databases are configured to be multi-master single-writer with automated failover. Control plane services have been modified to split DB reads directly to the read slaves and only write to the write-master. This distributes load across the database servers. OpenStack has many small horizontally-scalable components which can peacefully cohabitate on the same machines: the Nova, Keystone, and Glance APIs, for example. Stripe these across several small or modest hardware. Some services, such as the Nova scheduler, run the risk of race conditions when running multi-active. If the risk of race conditions is unacceptable, use ZooKeeper to manage leader election. In a Yahoo datacenter, DHCP is only used to provision baremetal servers. By statically declaring IPs in our instances via cloud-init, our infrastructure is less prone to outage from a failure in the DHCP infrastructure. Neutron used Dnsmasq to provide DHCP services, however it was not designed to address the complexity or scale of a dynamic environment. For example, Dnsmasq must be restarted for any config change, such as when a new host is being provisioned. In the Yahoo OpenStack clusters this has been replaced by ISC-DHCPD, which scales far better than Dnsmasq and allows dynamic configuration updates via an API. Adding security: Splitting the ITS from the IC allows us to block all network traffic from production compute nodes to the IC, and other parts of our control plane. If a malicious entity attacks a node serving production traffic, they cannot escalate from it to our control plane. Scale: The ITS hosts allow us to horizontally scale the core provisioning services with which nodes communicate. Flexibility: ITS allows Yahoo to manage remote sites, such as peering points, without building a new cluster in that site. Resources in those sites can now be managed by the nearest Yahoo owned & operated (O&O) datacenter, without needing to build a whole cluster in each site. Be prepared for faulty hardware! Running IaaS reliably at hyperscale is more than just scaling the control plane. One must take a holistic look at the system and consider everything. In fact, when examining provisioning failures, our engineers determined the majority root cause was faulty hardware. For example, there are a number of machines from varying vendors whose IPMI firmware fails from time to time, leaving the host inaccessible to remote power management. Some fail within minutes or weeks of installation. These failures occur on many different models, across many generations, and across many hardware vendors. Exposing these failures to users would create a very negative experience, and the cloud must be built to tolerate this complexity. Yahoo’s experience shows that one can run OpenStack at hyperscale, leveraging it to wrap infrastructure and remove perceived complexity. Correctly leveraged, OpenStack presents an easy, consistent, and error-free interface. Delivering this interface is core to our design philosophy as Yahoo continues to double down on our OpenStack investment. The Yahoo OpenStack team looks forward to continue collaborating with the OpenStack community to share feedback and code. This byline was originally written for and appears in CIO Review. In his Open Source Landscape keynote at LinuxCon Japan earlier this year, Jim Zemlin, Executive Director of the Linux Foundation said that the trend toward corporate-sponsored open source projects is one of the most important developments in the open source ecosystem. The jobs report released by the Linux Foundation earlier this year found that open source professionals are in high demand. The report was followed by the announcement that TODOGroup, a collaboration project for open source professionals who run corporate open source program offices, was joining the Linux Foundation. Open source is no longer exclusively a pursuit of the weekend hobbyist. Professional open source management is a growing field, and it’s critical to the success of your technology strategy. Open source has indeed proven itself to be a transformative and disruptive part of many companies’ technology strategies. But we know it’s hardly perfect and far from hassle-free. Many developers trust open source projects without carefully reviewing the code or understanding the license terms, thus inviting risk. Developers say they like to contribute to open source, but are not writing as much of it as they wish. By legal default, their code is not open source unless they make it so. Despite being touted as an engineering recruitment tool, developers don’t flock to companies who toss the words “open source” all over their tech blogs. They first check for serious corporate commitment to open source. Open source offers potential to lower costs, keep up with standards, and make your developers more productive. Turning potential into practice requires open source professionals on your team to unlock the open source opportunity. They will steer you out of the legal and administrative challenges that open source brings, and help you create a voice in the open source communities that matter most to you. Real work goes into managing the strategy, policies, and processes that enable you to benefit from the open source promise. Hence the emerging trend of hiring professionals to run open source program offices at tech companies across the industry. Program office sounds big. Actually, many companies staff these with as few as one or two people. Often the rest is a virtual team that includes someone from legal, PR, developer services, an architect, and a few others depending on your company. As a virtual team, each member helps address the areas they know best. Their shared mission is to provide an authoritative and supportive decision about all-things open source at your company. Ideally they are technical, respected, and lead with pragmatism – but what’s most important is that they all collaborate toward the same goal. The primary goal of the open source program office is to steer the technology strategy toward success using the right open source projects and processes. But the day-to-day program role is to provide services to engineers. Engineers need to know when they can use other people’s code within the company’s codebase (to ‘inbound’ code), and when they can publish company code to other projects externally (to ‘outbound’ code). Practical answers require an understanding of engineering strategy, attention to legal issues surrounding licenses (copyright, patent, etc. ), and familiarity with managing GitHub at scale. New open source projects and foundations will attract (or distract) your attention. Engineers will ask about the projects they contribute to on their own time, but in areas your company does business. They seek to contribute to projects and publish new projects. Are there risks? Is it worth it? The questions and issues you deal with on a regular basis will help give you a greater appreciation for where open source truly works for you, and where process-neglect can get in the way of achieving your technology mission. I’ve been running the open source program office at Yahoo for over six years. We’ve been publishing and supporting industry-leading open source projects for AI, Big Data, Cloud, Datacenter, Edge, Front end, Mobile, all the way to Zookeeper. We’ve created foundational open source projects like Apache Hadoop and many of its related technologies. When we find promise in other projects, we support and help accelerate them too, like we did with OpenStack, Apache Storm and Spark. Our engineers support hundreds of our own projects, we contribute to thousands of outside projects, and developers around the world download and use our open source code millions of times per week! We are able to operate at scale and take advantage of the open source promise by providing our engineers with a lightweight process that enables them to succeed in open source. You can do the same at your company. Open source professionals who run program offices at tech companies share openly – it comes with the territory. I publish answers about open source on Quora and I’m a member of TODOGroup, the collaboration project managed by the Linux Foundation for open source program directors. There, I share and learn from my peers who manage the open source programs at various tech companies. Bottom line: If you want to take advantage of the value that open source offers, you’ll need someone on your team who understands open source pragmatics, who’s plugged into engineering initiative, and who’s empowered to make decisions. The good news is you are not alone and there’s help out there in the open source community. Intuit, a creator of business and financial management solutions, is a leading enterprise customer for AWS. The Intuit Data team (IDEA) at Intuit is responsible for building platforms and products that enable a data-driven personalized experience across Intuit products and services. One dimension of this platform is the streaming data pipeline that enables event-based data to be available for both analytic and real time applications. These include—but are not limited to—applications for personalization, product discovery, fraud detection, and more. The challenge is building a platform that can support and integrate to over 50+ products and services across Intuit and one that further considers seasonality and the evolution of use cases. Intuit requires a data platform that can scale and abstract the underlying complexities of a distributed architecture, allowing users to focus on leveraging the data rather than managing ingestion. Amazon EMR, Amazon Kinesis, and Amazon S3 were among the initial considerations to build out this architecture at scale. 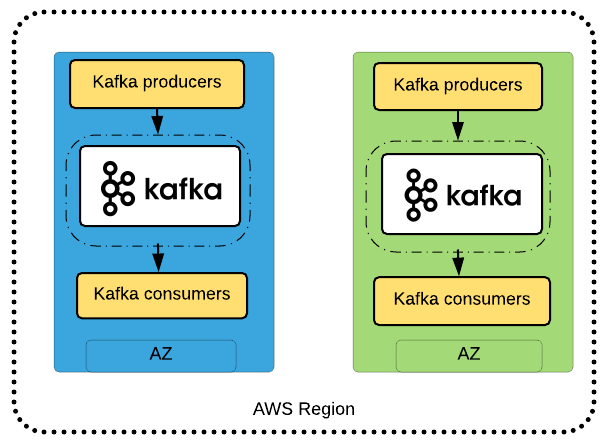 Given that Intuit had existing infrastructure leveraging Kafka on AWS, the first version was designed using Apache Kafka on Amazon EC2, EMR, and S3 for persistence. Amazon Kinesis provides an alternative managed solution for streaming, which reduces the amount of administration and monitoring required. For more information about Amazon Kinesis reference architectures, see Amazon Kinesis Streams Product Details. Note: This is an example and should not be implemented in a production environment without considering additional operational issues about Apache Kafka and EMR, including monitoring and failure handling. Before detailing Intuit’s implementation, it is helpful to consider the application architecture and physical architecture in the AWS Cloud. The following application architecture can launch via a public subnet or within a private subnet. The following architecture diagram represents an EMR and Kafka cluster in a VPC public subnet and accesses them through a bastion host to control access and security. The following architecture diagram represents an EMR cluster in a VPC private subnet with an S3 endpoint and NAT instance; Kafka can also be installed in VPC private subnets. Private subnets allow you to limit access to deployed components, and to control security and routing of the system. You access EMR and Kafka clusters through a bastion host. By now, you should have a good understanding of the architecture involved and the deployment model you might like to implement from this post. Set up Kafka on AWS. Spin up an EMR 5.0 cluster with Hadoop, Hive, and Spark. Run the Spark Streaming app to process clickstream events. Use the Kafka producer app to publish clickstream events into Kafka topic. Explore clickstream events data with SparkSQL. To implement the architecture, establish an AWS account, then download and configure the AWS CLI. 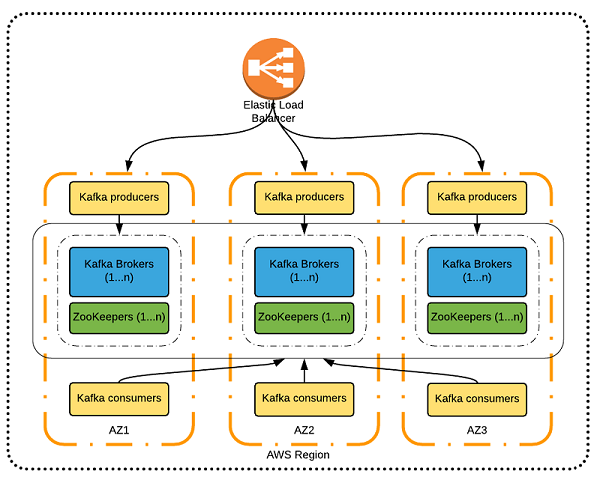 This post explains how to deploy Apache Kafka on AWS. By default, the template sets up one Kafka ZooKeeper instance and one broker instance. Choose Upload a template to Amazon S3 template URL. Optionally, specify a tag for the instance. Choose Next. Review choices, check the IAM acknowledgement, and then choose Create. The stack takes several minutes to complete as it creates the EC2 instance and provisions Apache Kafka and its prerequisites. Return to the CloudFormation console. When the CloudFormation stack status returns CREATE_COMPLETE, your EC2 instance is ready. On the Output tab, note the DNS names for Kafka ZooKeeper and broker. This step allows the creation of the EMR cluster. You may use the following sample command to create an EMR cluster with AWS CLI tools or you can create the cluster on the console. If you decide to create the cluster using the CLI, remember to replace myKeyName, myLogBucket, myRegion, and mySubnetId with your EC2 key pair name, logging bucket, region, and public/private subnets. The cluster is created in approximately 10 minutes and changes to the “Waiting” state. Kafka maintains feeds of messages in topics. A topic is a category or feed name to which messages are published. To create a Kafka topic, use the following instructions. Note: Change the ZooKeeper instance DNS address based on your environment. The Spark Streaming app is able to consume clickstream events as soon as the Kafka producer starts publishing events (as described in Step 5) into the Kafka topic. For this post, I used the Direct Approach (No Receivers) method of Spark Streaming to receive data from Kafka. After the Kafka producer starts publishing, the Spark Streaming app processes clickstream events, extracts metadata, and stores it in Apache Hive for interactive analysis. Below code explains. To run the Spark streaming application, use the following instructions. Get the source code from the aws-blog-sparkstreaming-from-kafka GitHub repo. Run “mvn clean install” to generate the JAR file and copy the kafkaandsparkstreaming-0.0.1-SNAPSHOT-jar-with-dependencies.jar file from your /target folder to an S3 bucket. Use the EMR add-steps command to run the Spark Streaming app and process clickstream events from the Kafka topic. Note: Modify the above command to reflect the ClusterId (for example, j-17DQ5BN6HWKAC), S3 bucket, and KafkaBrokerDNS value. Get the source code from the aws-blog-sparkstreaming-from-kafka GitHub repo. Run “mvn clean install” to generate the JAR file and copy the kafkaandsparkstreaming-0.0.1-SNAPSHOT-jar-with-dependencies.jar file from your /target folder to the Kafka broker instance. In the previous steps, clickstream events were generated using the Kafka producer and published to the Kafka topic. These events have been processed with Spark Streaming. Next, log in to the EMR master node, launch a SparkSQL session, run a few SQL commands to explore the processed events that you have published. Running broker processes does not guarantee that the cluster is in a good state. The Intuit team experienced problems with undetected Kafka even though the Kafka broker process was running. Monitor the ZooKeeper path (/broker/ids) to make sure that brokers are registered under its path. Be aware that a different machine image could affect the functionality or performance of Kafka. Make sure to use separate instances for Kafka brokers and zookeepers. This makes debugging problems easier. Having more than one Kafka cluster in different Availability Zones can help zone failover issues and also help in upgrading, as compared to having one cluster that requires one-on-one upgrades. I would like to thank the Intuit Data team (IDEA) for their contributions to this post. Step 2: Spin up an EMR 5.0 cluster with Hadoop, Hive, and Spark. Get the source code from the aws-blog-sparkstreaming-from-kafka GitHub repo. Run "mvn clean install" to generate the JAR file and copy the kafkaandsparkstreaming-0.0.1-SNAPSHOT-jar-with-dependencies.jar file from your /target folder to an S3 bucket. Get the source code from the aws-blog-sparkstreaming-from-kafka GitHub repo. Run "mvn clean install" to generate the JAR file and copy the kafkaandsparkstreaming-0.0.1-SNAPSHOT-jar-with-dependencies.jar file from your /target folder to the Kafka broker instance. Arch Linux has updated bind (denial of service), lib32-openssl (denial of service), and openssl (denial of service). denial of service) and openssl (F24: multiple vulnerabilities). (certificate verification bypass), graphicsmagick (multiple vulnerabilities), pdns (three denial of service flaws), thunderbird (multiple vulnerabilities), wget (two vulnerabilities), and zookeeper (buffer overflow). (Leap42.1, 13.2: denial of service), freerdp (Leap42.1; 13.2: two vulnerabilities), and openssl (Leap42.1: multiple vulnerabilities). Oracle has updated kvm (OL5: two vulnerabilities) and openssl (OL7; OL6: multiple vulnerabilities). Slackware has updated bind (denial of service). of service) and Pillow (14.04: multiple vulnerabilities). We are proud to announce that Omid (“Hope” in Persian), Yahoo’s transaction manager for HBase , has been accepted as an Apache Incubator project. Yahoo has been a long-time contributor to the Apache community in the Hadoop ecosystem, including HBase, YARN, Storm, and Pig. Our acceptance as an Apache Incubator project is another step forward following the success of ZooKeeper  and BookKeeper , which were born at Yahoo and graduated to top-level Apache projects. These days, most NoSQL databases, including HBase, do not provide the OLTP support available in traditional relational databases, forcing the applications running on top of them to trade transactional support for greater agility and scalability. However, transactions are essential in many applications using NoSQL datastores as the main source of data, for example, in incremental content processing systems. Omid enables these applications to benefit from the best of both worlds: the scalability provided by NoSQL datastores, such as HBase, and the concurrency and atomicity provided by transaction processing systems. Omid provides a high-performant ACID transactional framework with Snapshot Isolation guarantees on top of HBase , being able to scale to thousands of clients triggering transactions on application data. It’s one of the few open-source transactional frameworks that can scale beyond 100K transactions per second on mid-range hardware while incurring minimal impact on the latency accessing the datastore. At its core, Omid utilizes a lock-free approach to support multiple concurrent clients. Its design relies on a centralized conflict detection component called Transaction Status Oracle (TSO), which efficiently resolves write-set collisions among concurrent transactions . Another important benefit is that Omid does not require any modification of the underlying key-value datastore – HBase in this case. Moreover, the recently-added high-availability algorithm eliminates the single point of failure represented by the TSO in those deployments that require a higher degree of dependability . Last but not least, the API is very simple – mimicking the transaction manager APIs in the relational world: begin, commit, rollback – and the client and server configuration processes have been simplified to help both application developers and system administrators. Efforts toward growing the community have already been underway in the last few months. Apache Hive  contributors from Hortonworks expressed interest in storing Hive metadata in HBase using Omid, and this led to a fruitful collaboration that resulted in Omid now supporting HBase 1.x versions. Omid could also be used as the transaction manager in other SQL abstraction layers on top of HBase such as Apache Phoenix , or as the transaction coordinator in distributed systems, such as the Apache DistributedLog project  and Pulsar, a distributed pub-sub messaging platform recently open sourced by Yahoo. Since its inception in 2011 at Yahoo Research, Omid has matured to operate at Web scale in a production environment. For example, since 2014 Omid has been used at Yahoo – along with other Hadoop technologies – to power our incremental content ingestion platform for search and personalization products. In this role, Omid is serving millions of transactions per day over HBase data. We have decided to move the Omid project to “the Apache Way” because we think it is the next logical step after having battle-tested the project in production at Yahoo and having open-sourced the code in Yahoo’s public Github in 2012 (The Omid Github repository currently has 269 stars and 101 forks, and we were asked by our colleagues in the Open Source community to release it as an Apache Incubator project.). As we aim to form a larger Omid community outside Yahoo, we think that the Apache Software Foundation is the perfect umbrella to achieve this. We invite the Apache community to contribute by providing patches, reviewing code, proposing new features or improvements, and giving talks at conferences such as Hadoop Summit, HBaseCon, ApacheCon, etc. under the Apache rules. We see Omid being recognized as an Apache Incubator Project as the first step in growing a vibrant community around this technology. We are confident that contributors in the Apache community will add more features to Omid and further enhance the current performance and latency. Stay tuned to @ApacheOmid on Twitter! Arch Linux has updated chromium (multiple vulnerabilities), jansson (denial of service), lib32-libgcrypt (flawed random number generation), and php (multiple vulnerabilities). forgery), pdns (multiple denial of service flaws), php5 (multiple vulnerabilities), phpmyadmin (multiple vulnerabilities), and zookeeper (buffer overflow). 2014), openjpeg2 (F23: out-of-bounds write), and php-adodb (F24; F23: cross-site scripting). At the time we started, we could not find any existing open-source messaging solution that could provide the scale, performance, and features Yahoo required to provide messaging as a hosted service, supporting a million topics. So we set out to build Pulsar as a general messaging solution, that also addresses these specific requirements. 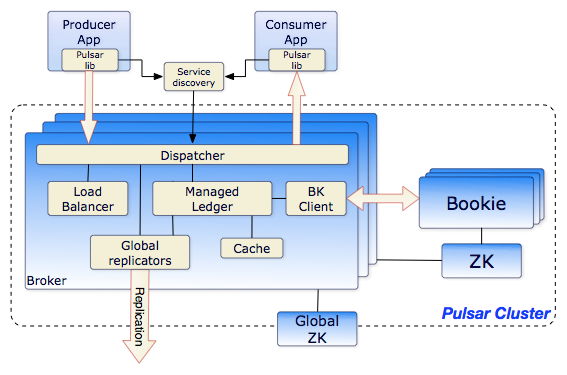 Pulsar is a highly scalable, low latency pub-sub messaging system running on commodity hardware. It provides simple pub-sub messaging semantics over topics, guaranteed at-least-once delivery of messages, automatic cursor management for subscribers, and cross-datacenter replication. Using Pulsar, one can set up a centrally-managed cluster to provide pub-sub messaging as a service; applications can be onboarded as tenants. Pulsar is horizontally scalable; the number of topics, messages processed, throughput, and storage capacity can be expanded by adding servers to the pool. Pulsar has a robust set of APIs to manage the service, namely, account management activities like provisioning users, allocating capacity, accounting usage, and monitoring the service. Tenants can administer, manage, and monitor their own domains via APIs. Pulsar also provides security via a pluggable authentication scheme, and access control features that let tenants manage access to their data. Application development using Pulsar is easy due to the simple messaging model and API. Pulsar includes a client library that encapsulates the messaging protocol; complex functions like service discovery, as well as connection establishment and recovery, are handled internally by the library. At a high level, a Pulsar instance is composed of multiple clusters, typically residing in different geographical regions. A Pulsar cluster is composed of a set of Brokers and BookKeepers (bookies), plus ZooKeeper ensembles for coordination and configuration management. A Pulsar broker serves topics. Each topic is assigned to a broker, and a broker serves thousands of topics. The broker accepts messages from writers, commits them to a durable store, and dispatches them to readers. The broker also serves admin requests. It has no durable state. The broker has built-in optimizations; for example, it caches the data in order to avoid additional disk reads when dispatching messages to clients as well as replication clusters. Pulsar brokers also manage the replicators, which asynchronously push messages published in the local cluster to remote clusters. Apache BookKeeper is the building block for Pulsar’s durable storage. BookKeeper is a distributed write-ahead log system, a top-level Apache project that was originally developed at and open-sourced by Yahoo in 2011. BookKeeper has an active developer community with contributors across the industry. Using the BookKeeper built-in semantics, Pulsar creates multiple independent logs, called ledgers, and uses them for durable message storage. Bookkeeper hosts, called bookies, are designed to handle thousands of ledgers with concurrent reads and writes. BookKeeper is horizontally scalable in capacity and throughput; from an operational perspective we can elastically add more bookies to a Pulsar cluster to increase capacity. By using separate physical disks (one for journal and another for general storage), bookies are able to isolate the effects of read operations from impacting the latency of ongoing write operations, and vice-versa. Since read and write paths are decoupled, spikes in reads – which commonly occur when readers drain backlog to catch up – do not impact publish latencies in Pulsar. This sets Pulsar apart from other commonly-used messaging systems. Managed Ledger represents the storage layer for a single topic. It is the abstraction of a stream of messages, with a single writer, and multiple readers, each with its own associated cursor position, the offset of the reader in the message stream. A single managed ledger uses multiple BookKeeper ledgers to store the data. Cursor positions are maintained in per-cursor ledgers. A Pulsar cluster runs a ZooKeeper (another top-level Apache project open-sourced by Yahoo in 2008) ensemble used for coordinating assignment of topics among brokers, and storing BookKeeper metadata. In addition, Pulsar runs a Global ZooKeeper ensemble to store the provisioning and configuration data. At Yahoo, we have presence in multiple regions and our users create global topics that are replicated between these regions. The Global Zookeeper ensemble keeps provisioning and configuration data consistent globally. We can tolerate higher write latencies on these writes (e.g. : ~150ms latency for configuration writes). The load balancer is a distributed service that runs on the brokers, to make sure the traffic is equally spread across all available brokers. Since Pulsar brokers have no durable state, topics can be redistributed within seconds. The Pulsar topic is the core of the system; applications and components communicate by publishing to and consuming from the same topic. Topics are created dynamically as needed when a producer (writer) starts publishing on it; and topics are removed when not in use. Pulsar is designed for low-publish latencies at scale. Our typical publish latencies on average are well below 5ms. With SSD as the bookie journal device, Pulsar can achieve 99 percentile latencies of 5ms with two guaranteed copies and total ordering. The latency remains within the acceptable range until the throughput reaches the limit of the disk IO capacity. Pulsar supports partitioned topics, which can further increase the per-topic throughput. Pulsar backs major Yahoo applications like Mail, Finance, Sports, Gemini Ads, and Sherpa, Yahoo’s distributed key-value service. We deployed our first Pulsar instance in Q2 2015. Pulsar use has rapidly grown since then, and as of today, Yahoo runs Pulsar at scale. As Pulsar use grows at Yahoo, we have been scaling the service horizontally. Most of the challenges we faced were with JVM GC impacting publish latencies, and reducing failover times when the number of topics on a broker went up to tens of 1000s (now 40,000). This led to significant changes to the Pulsar broker and to BookKeeper. Pulsar is a highly scalable pub-sub messaging system, production-ready and battled tested at Yahoo. We are glad to make Pulsar available as open source under Apache License Version 2.0. Detailed instructions and documentation are available at Yahoo’s Github repository. Our goal is to make Pulsar widely used and well integrated with other large-scale open source software, and we welcome contributions from the community to make that happen.